The authenticity and versatility of the tones never fails to satisfy - nobody's going to mess with your riffs with this behemoth behind you. Awesome metal tones. Decent feature set. Road-worthy build. We'd have liked a separate three-band EQ for each OD channel. The amp gurus at Blackstar have already ensnared some of the biggest names in metal, but they've kept their focus squarely on heavier things with the HT Metal series. The range is based on the company's award-winning HT and Venue amps, and as such, covers the gamut of sizes and wattages, from the teeny one-watt HT Metal 1 head and combo all the way to this mammoth combo, the HT Metal 60. "The HT Metal 60 is made for the stage, and its pulverising tones get seriously loud"
With two 12-inch Celestion speakers and three footswitchable channels, the Metal 60 is a beast of a closed-back combo. The control panel is considerably beefed up, too: you get a full EQ panel, bass and treble controls plus a voice button on the clean channel, as well as master presence and resonance knobs to give your sound the cut and rumble you need for playing live. 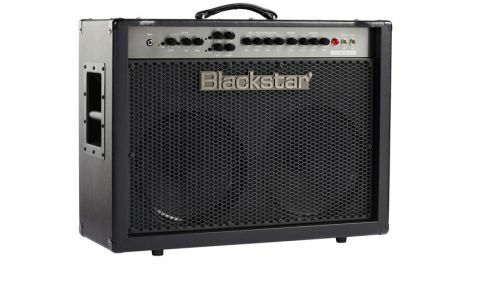 This brute is all-valve and boasts Blackstar's patented ISF (Infinite Shape Feature) control, which grants you access to the biggest metal tones from both sides of the Atlantic, while the larger amps also feature footswitchable overdrive channels, for multiple shades of filth. Though it can also be used for practice (thanks to a speaker-emulated output and mp3/line input), the HT Metal 60 is made for the stage, and its pulverising tones get seriously loud. There are two channels of dirt, and Blackstar reckons OD1 is best used for rhythm, and OD2 for leads. To our ears, OD1 is a little more vintage-voiced and open, OD2 more modern and saturated, but both will utterly annihilate your audience. Plug in a seven-string or baritone, and the uncompromising 6L6-fuelled grind is sure to impress. The Metal 60 offers two clean variations: the first voiced like a Class A amplifier with plenty of crunch; the other a more modern voicing with huge headroom. The latter is where you'll spend most of your time for crystal-clear intros and breakdowns - stick a chorus pedal in the effects loop and you'll be rewarded with instant Metallica-style ballads.